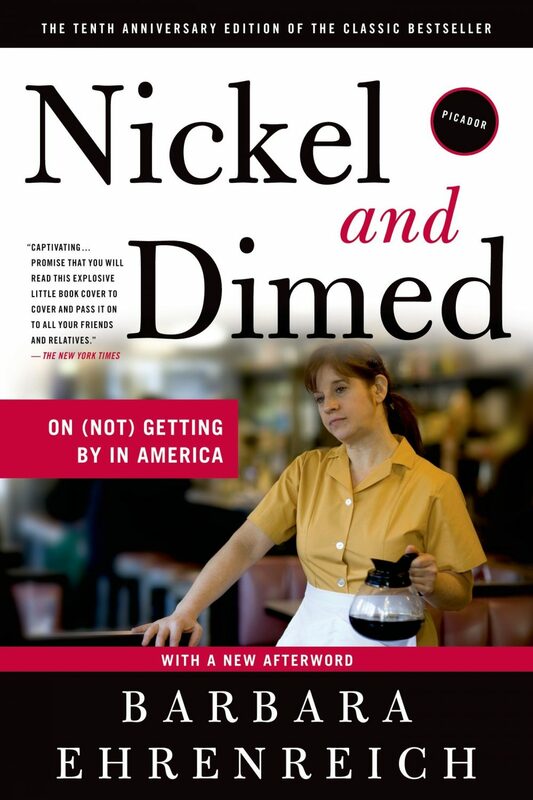 I love books like Nickel and Dimed: On (Not) Getting By in America for some reason. I like reading about the “behind the scenes” in American life. I read Fast Food Nation the summer after my freshman year in college and loved it. I like knowing all about big industries in our country and how they function. This title seemed vaguely familiar to me (I’m sure I heard about it somewhere seeing as it was a best seller), and when I came across a reference to it on All and Sundry as she tried to find a housekeeping service, I read a few reviews of it on Amazon and promptly put in a request for it at the library (have I mention how much I love and adore our library?). Barbara Ehrenreich is a journalist and author and, at the challenge of a friend, decided to take on lower-class life and see if it was possible to survive financially. She began as a waitress in Key West, worked in housekeeping and elderly care in Maine, and finally at Walmart in Minnesota. Watching her struggle to find housing, work back-breaking and mind-numbing jobs, and appreciate first hand how difficult life at the poverty level is. If you’re only going to read one chapter, it ought to be the last one, which discusses the overall themes she found in her journey, including the problems with housing, why pay stays low, and how these individuals function. She talked about how even when workers are in high demand (as the case was in Minnesota), there is no good housing available in their price ranges. She also discussed how employees will do almost anything to keep from raising wages, preferring to offer benefits, doughnuts, more breaks, and the like, because those can be taken away far more easily than a paycut can be made. Some of the main problems that kept individuals in these desperate circumstances, at least in her view, is the fear of getting a new job (better the problems you know than the ones you don’t, she finds), the hardship of getting a new job (when do you interview when you work seven days a week or when you don’t have a car or any nice clothing), the difficulty of gathering the money to make a deposit on an apartment (meaning people pay much higher rates for weekly hotels), etc. It really was horrifying to see how difficult it is to get out of circumstances like this . One other thing that makes me like this book even more: I talked Bart’s ear off about the book at dinner on Monday night and he’s now read nearly half of it. We never read the same books, so it’s unspeakably cool to me that he’s reading this one. And a worthwhile book it is. I went to the grocery store the night I finished this book. An old man with a nametag nearly hit me twice with a mop bucket. I smiled and begged his pardon. I hope he’s getting by better than those that Barbara met. Hey, I really enjoyed this book too. Probably because I’m a Sociology major. It was really frustrating to read about this but has given me a lot of insight to the clients I work with as a school social worker. For instance I’m pretty understanding of people living in motels. Plus I always feel bad when I go to Wal*Mart and think about what Barbara Ehrenreich wrote about the workers’ struggles there. I’m glad you liked it too. Jaime! It’s great to hear from you. From Facebook, iit looks like life is wonderful for you. Thanks for commenting!